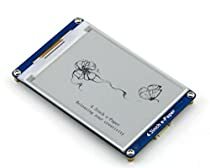 4.3 Inch E-Paper 800x600/4.3 Inch E-Paper Is An E-Book Display Module With Serial Interface DevelopedThis is a 4.3-inch e-ink display module, supports a maximum resolution of 800x600, using serial communication, built-in Chinese and English fonts. It also supports low power consumption mode. If you don't want to know the complex working theory of E-ink screen, or the algorithms of graphics, text, and pictures, it will be your best choice. You only need a serial port to implement all features, let it go! Unleash your creative potential.